Looking good neil will be a great adition to your armoured trains. 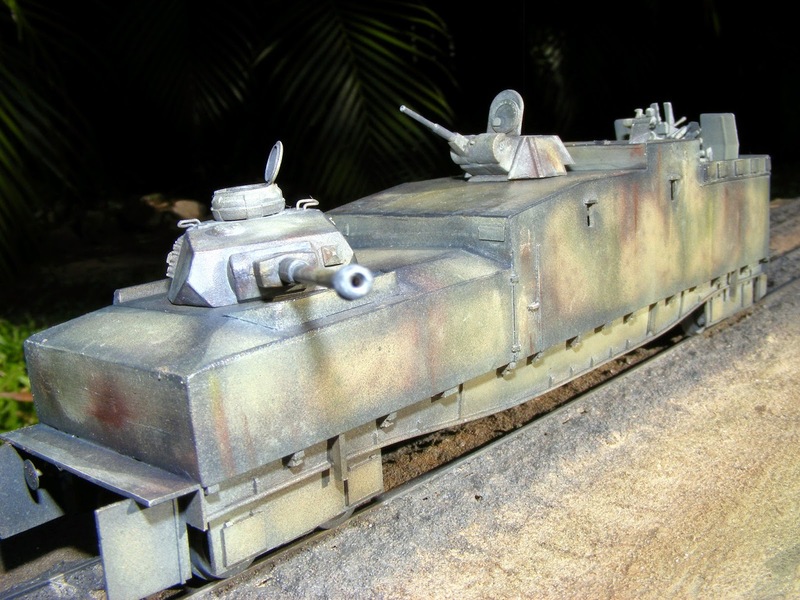 i have scaled up some plans for a panzerjager-triebwagen i intend to scratchbuild. 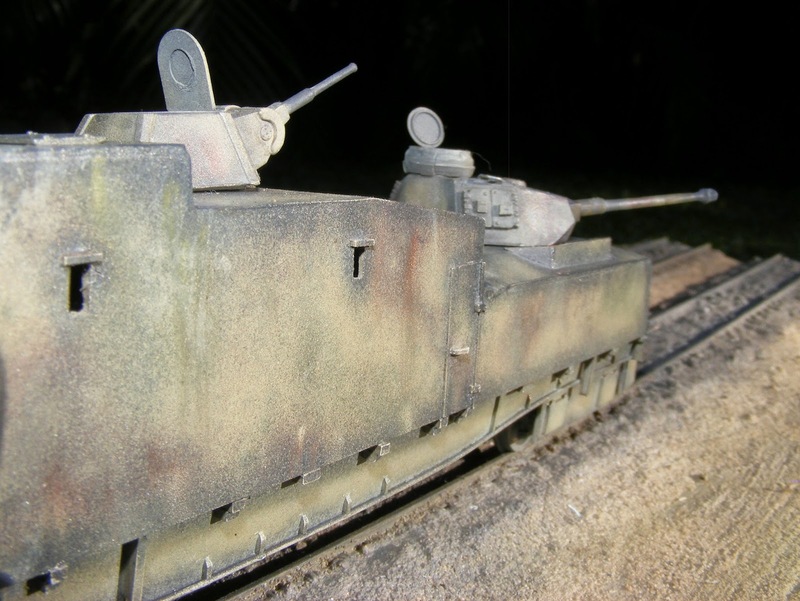 when you sprayed your armoured train did you go cam ,gloss,wash,mat order as there dont seem that you can go many coats over that detail before you cover it over?. Hi Bazer. Somewhere "down the track" I would like to scratch a Pzr Triebwagen as well. Good luck with yours, I'd be interested to see how you go. The detail on the lower chassis is much more defined than the average kit in this scale. A few coats of spray paint won't diminish the details appearance. The sides seem to be smooth and unbolted/unrivetted, would seem to be neatly welded in reality, very hard to see small details on the pictures of the real thing. This armoured wagon has just one coat of Humbrol 'rattle can' acrylic undercoat at this stage. I'm not going to finish painting until I have a new reference book coming that might have clearer pictures of the wagon, so I can do any modifications first. When its ready for top coat, I will pre shade (with a dark grey or black) around details and lower areas and areas that would naturally be ins shade, then will top coat with a light spray of acrylic (probably yellow). I'll build up the coat is some areas, and go lighter in others to try to replicate the effects or natural light and shadow. Then do a wash with very diluted black over everything .Then lightly spray some grime on the lower areas. Then will do some dry brush highlights on some areas and small details to make them stand out a bit. Sad that your blog seems to be on a 'hiatus' - hope nothing serious has caused the pause? I regularly check back, mostly because your blog is such a terrific resource for Soviet trucks. Anyway, hope all is well. Steve the Kitnoob.